Composed of 524 acres of stunning countryside, Lickey Hills Country Park is one of those places that you have to tick off your list. With a delightful combination of heathland, woodland and grassland, there is something for everyone to enjoy. A very notable feature of this area of Country Park is the toposcope. It was erected by the Cadbury Family to celebrate the Park’s centenary. Standing some 297 metres above sea level, you can see for miles by sharing its vantage point. About a kilometre away lies the famous obelisk folly. It isn’t visible from the road so if you want to go and have a look (which is strongly recommended!) it is advisable to double check its location on a map. Interestingly, J. R. R. Tolkien moved to the suburb of Rednal just North of the Country Park. It is said that the hills, which he frequented, were the inspiration for the Shire in his books. 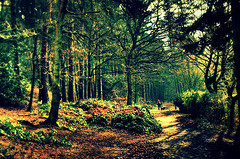 Popular with mountain bikers, hikers and walkers, Lickey Hills has facilities to suit all tastes. Once you’ve indulged in the outdoors and explored the area, why not head to the Visitor Centre. You can get light snacks or hot food and enjoy the scenery. And if the kids are still full of beans, you can let them loose on the play area to expend some energy before heading home.